In the board game Attika players get to compete to build the best city they can. The only challenge is that you have to make room for everyone who may need a spot in your city. You'll have to move fast to be sure to get the best land to build on. Be careful, you wouldn't want to run out of money partway through the building of your new city. There are many ways to cut the costs on your projects such as finding natural resources on the island of Attika. Attika is a game full of strategy that will have you scratching your head to find the best possible scenario. 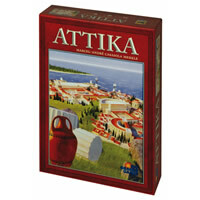 Try playing Attika with your family today. See the Attika game rules and instructions. Please keep in mind that the official Attika party rules and instructions could be different depending on the game version you have. The rules below are some of the exact directions on how to play Attika. Share with us your comments, funny stories, tips, advice, strategies, creative ways to play, questions about how to play, problems with the rules or anything you want about Attika. All submissions will be reviewed within 24 hours. Click here to add your Attika comments.